Lovely Professional University (LPU) distance education portal known as e-connect, brings Students, Study Centres and the University even more closer. It's a 24x7 available portal helps students to learn at the time they prefer. Each student enrolls in Lovely Professional University distance education courses gets a username & password to access to this e-learning portal. They portal, e-connect, supports all the courses offered by the university. Lovely Professional university e-learning portal has the following features. All of the above mentioned feature make it very easy for students to learn & communicate with faculty members & administrative department of the university. Students can also discuss any topic in the forum or can chat with faculty on various academic issues. e-tests evaluates students & provide result on spot, which makes no waiting time for the result. 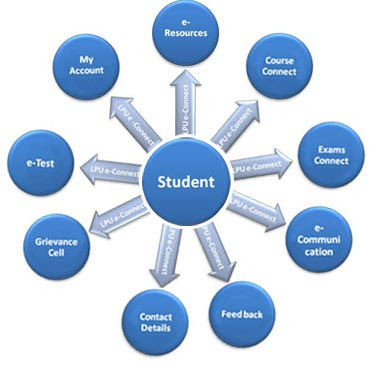 Grievance cell help student to share their grievance & build a strong relation with university. Above all you can share your feedback with university which helps university to improve the system.